Last week I was talking about how I considered The Warriors, with its stark and rather nightmarish urban setting, one of the key movies that influenced the 80’s. I consider today’s pick an offspring of sorts although Street Trash from 1987 may also be as influential as any movie can be. You could say it pushed the boundaries of horror movies (or pitch black comedies depending on how you look at it) into something almost entirely different resembling, and there’s no better way of putting it, a “trash movie”. I’m not talking about mere exploitation here, mind you, but a movie that is beyond gross, filthy, mindless, abusive, offensive, disgusting, outrageous and just plain ugly. And it’s all frickin’ brilliant, I tell you. It may feel rather harmless today in this wild world we’re living in but back in ’87, the year of “Walking Like An Egyptian” for crying out loud, it must have caused quite an uproar. To put things a little more into perspective, it makes Peter Jackson’s contemporary opera prima (and overly gory) Bad Taste seem like a juvenile effort. Street Trash follows the bizarre exploits of two bums (Fred and Kevin) living in New York’s skid row. Life in this part of the city is though. 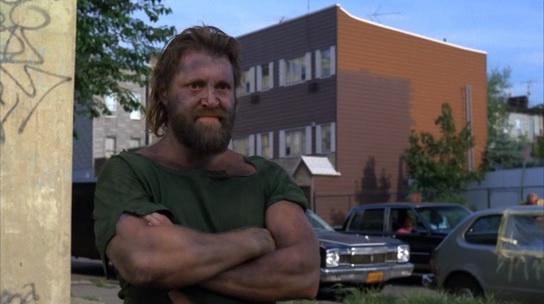 In addition to hunting for food, wondering which denizen they’re going to steal next and seeking shelter, they must deal with the sociopathic inhabitant of a nearby junkyard, a deranged Vietnam vet who goes by the name of Bronson. This guy has proclaimed himself the king of the slums and is utterly insane, posing a threat to any hobo that disagrees with him. The flaky social balance of this charming neighborhood is completely disrupted when the owner of a liquor store discovers a long forgotten case of alcoholic drinks in his basement. 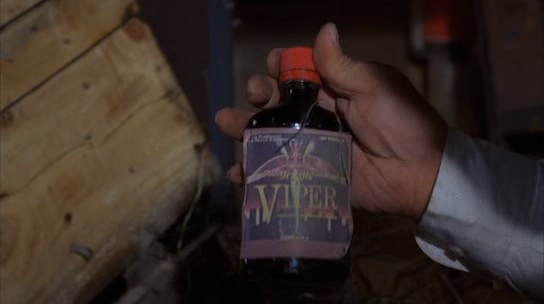 The out-of-date bottles curiously exhibit the label “Viper” and they look unlike any other beverage (not to mention particularly dangerous), so the clueless guy has no better idea than to sell these to the local hobos for one measly dollar each. The true properties of Viper, however, are as devastating as Monkey Island’s grog since a single sip of the drink liquifies people into a steaming and stinking mass of flesh and bones. This is in essence Street Trash for you. It may have signaled the beginning of the end in a way because, let’s face it, the horror genre went downhill in the 90’s especially because of similar low-budget underground movies yet uninspired that gave a bad rap to the term “B-movie”. 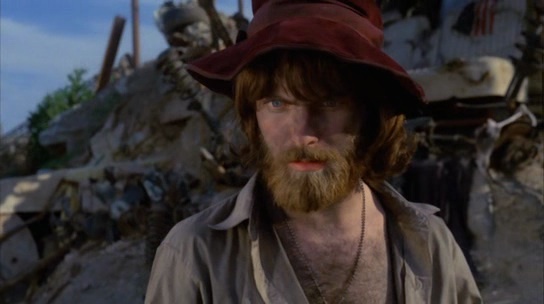 But I can’t blame Street Trash for attempting something different and succeeding – make no mistake, this is a great cult movie in its own right and the unique setting and style are a feast for the eyes… if you can stomach them. Really, you can almost feel dirty from watching this movie. It obviously owes a lot to Frank Henenlotter’s deranged masterpiece Basket Case and Troma’s The Toxic Avenger, but I can guarantee that you won’t see anything quite like Street Trash. There is one scene in particular that can’t be described with words and has to be seen to be believed including a hobo’s… private part being tossed around the junkyard. 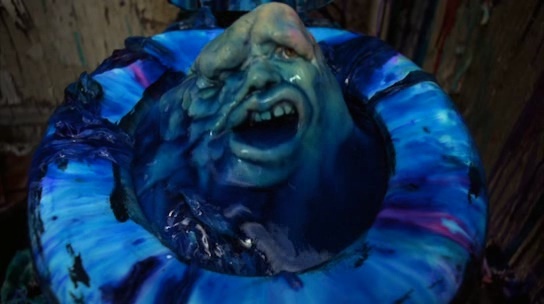 And don’t get me started on those gory melting scenes – Viper not only turns you into a hopeless pile of goo, it makes you go down in a really messy way. 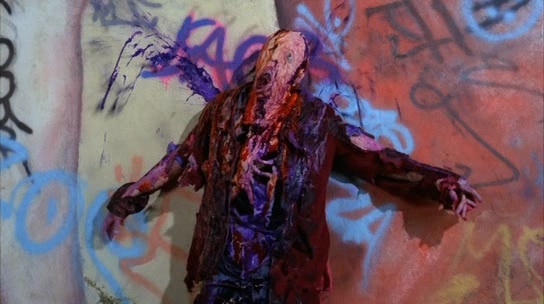 In fact, Street Trash is credited for kickstarting the “melt movie” horror subgenre or, in other words, movies with people that melts. Man, I love this kind of stuff. By the way, Fred looks strikingly similar to Torgo from Manos: The Hands Of Fate and I’ve always wondered if that was an actual homage on purpose. I can’t say there’s any resemblance whatsoever between these movies except that Manos makes you feel bored sick and Street Trash just plain sick. 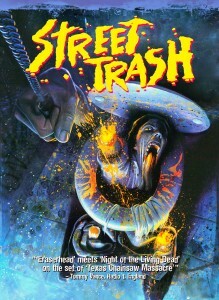 Street Trash can be acquired from Synapse Films. I’ve finally watched the whole Street Trash and I agree it’s an experience not to be missed… if you’re the sort of person who wants to try everything (for example a suspicious brand of booze you find in your basement ). I think even in today’s world this movie doesn’t have too much competition at what it does and I’m now even more proud of having included a “melting scene” in Snakes of Avalon. See? This is the movie that inspired you before you even knew it! The first time I watched this, I was baffled at the format of this film. Who’s really the main character? It seems to follow everyone equally (not to mention including Vietnam flashbacks?) For a film that has a couple of melts in the beginning then a bunch at the end, there’s just a bunch of filler. But what WONDERFUL FILLER it is! So many times you put in a film, get pumped about five minutes through then have to sit through a hour’s worth of mindless filler. Street Trash? NO WAY! It may not be conducive to the plot, but it’s still freakin’ awesome. Thanks Street Trash! Hey Alexander, that was a great post. Thanks for sharing your thoughts! How can a snake eat an animal that is larger sized than it truly is head?